Where and how are heavy elements synthesized? The creation of heavy elements, such as gold, platinum and uranium, require an extremely violent merger (between two neutron stars or a neutron star and a black hole) and supernovae cannot explain the observed abundances of heavy elements. Such powerful mergers also give off gravitational waves that can be detected by LIGO/Virgo. Last year in August, astronomers around the world made their first observations of a neuron star merger (GW170817) after its gravitational waves were picked up by LIGO. These observations confirmed for the first time that these mergers are indeed our primary cosmic mines for heavy elements. The GROWTH team led a multiwavelength follow up of the GW170817 merger event and proposed a theoretical model, called the "cocoon" model (see Science, 358, 1559) to coherently describe the observations of the event across the electromagnetic spectrum. Further radio data of GW170817 confirmed the validity of this model (see Nature, 554, 207) providing first glimpses into how heavy elements are synthesized. The GW170817 marked a major milestone for our understanding of the Universe but many questions remain. To answer them, astronomers need to continue to routinely detect and study such events. 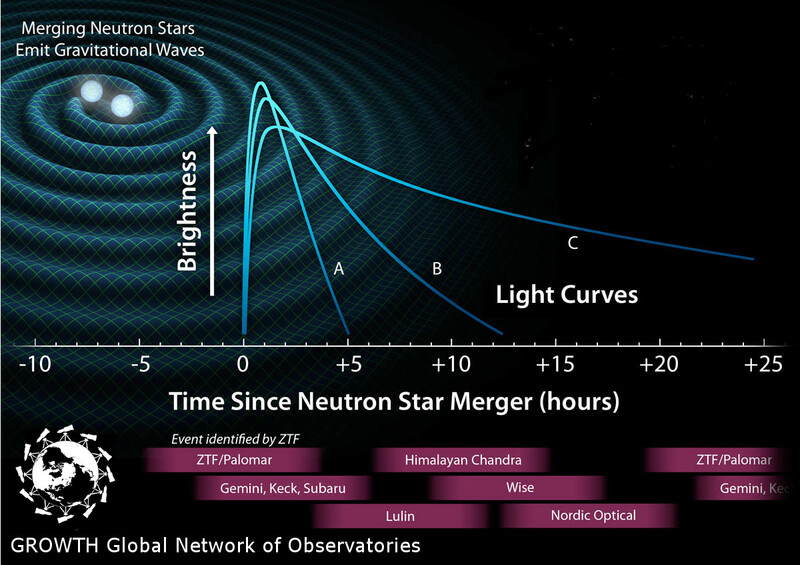 There are two main challenges associated with the detection and observation of neutron star mergers. First, they are extremely rare with a rough frequency of 1 event per 10,000 years per galaxy. Second, they give rise to optical transients that last less than one day. Working in conjunction with advanced LIGO, wide field imagers such as ZTF will be employed to precisely identify the location of the optical transient associated with the gravitational wave merger. However, to identify the one candidate associated with the merger as well as analyse the heavy element production, it is critical to conduct a prompt follow-up with a global network of telescopes in the first 24 hous after discovery. Using the brightness profile evolution as well as the optical and near-infrared spectrum of the observed mergers will allow us to deepne our understanding of the production of heavy elements. GROWTH will enable precisely these measurements with the longitudinal coverage provided by our national and international partners. 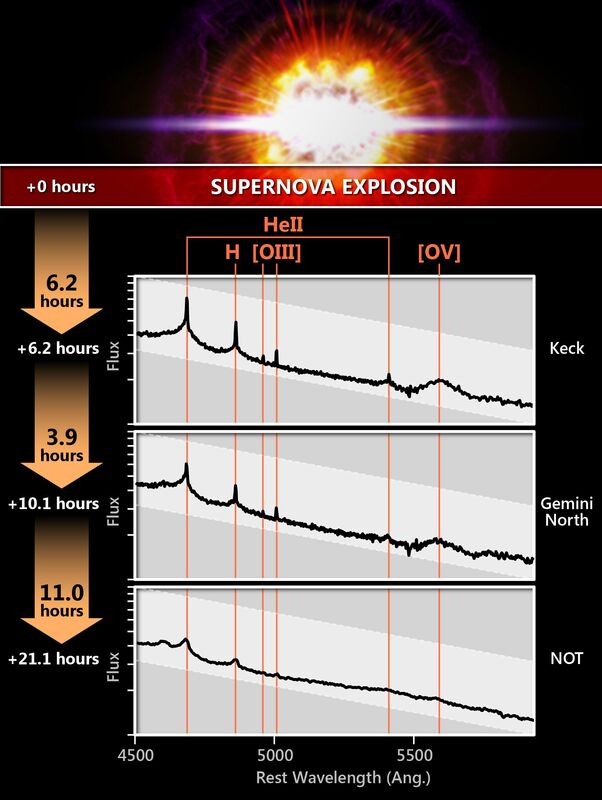 Supernovae (SNe) are brilliant transients, about a billion times brighter than the Sun, that represent the end-points in the life cycle of a star. Type Ia SNe have been used to measure cosmological distances with remarkable accuracy when used as standardizable candles. This led to one of the most remarkable discoveries in modern history - the accelerated expansion of the Universe. Yet, exactly what exploded is still a matter of debate. The two leading models suggest that it is either a pair of merging white dwarfs, or a white dwarf accreting mass from a younger companion star. However, to disentangle these two models we need to build a significant statistical sample of such SNe through very early multi-wavelength observations immediately after explosion. We will employ the GROWTH global network of observatories to do just that. Resolving the astrophysical nature of Type Ia SNe will have profound implications for the accuracy of the measurements of distances in the Universe, and by extension for the study of dark energy, the cosmic component responsible for the accelerated expansion. We also know of another type of SNe, the type II SNe. These are stars over ten times more massive than the Sun that explode due to core-collapse to produce many of the elements we know in the periodic table. Yet, we do not know what flavor of core-collapse a star of a given initial mass undergoes. Using a new spectroscopic technique we can directly diagnose the chemistry of the progenitor and unveil its properties, provided that the spectrum is obtained rapidly within the first 24 hours of explosion. ZTF can discover one such newborn supernova every night and GROWTH can provide the rapid spectroscopy giving us the tools to analyse and better understand type II SNe. Last but not least, the rapid follow-up observations of astronomical objects, made possible by the GROWTH global network, will also be used to study the nature, frequency and properties of another flavor of dying massive stars resulting in violent and fast-fading explosions known as Gamma-Ray Bursts. Where are the small near-earth asteroids and what are their orbits? While detection and observational follow-up of large, potentially hazardous asteroids has long been an international effort managed by the International Astronomical Union (IAU), the class of asteroids with diameter smaller than about 140 m, classified as near-earth asteroids (NEAs), is less well-studied. Yet, NEAs can still cause significant damage as shown by events like the one in Tunguska and Arizona. Builidng on improved techniques for detection of small NEAs that have been recently demonstrated by the PTF consortium, we plan to study properties of NEAs such as size, origin, and composition. The prompt alert and follow-up system being developed for GROWTH transient detection is also ideal for observations of small NEAs where high angular rates of motion demand prompt follow-up that cannot be achieved with conventional moving object processing systems. 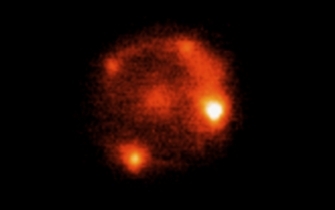 After initial detection, the trajectory of the detected object will be determined with subsequent observations of the field by two wide-field imagers spaced about one hour apart. 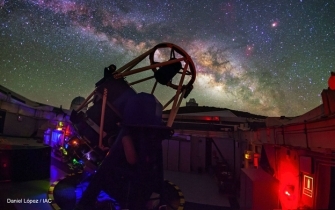 The GROWTH network of observatories, and in particular, imagers with moderate field of view such as those in Fenton Hill, Mt. Laguna and Lulin Observatory, is critical in determinig the orbit of the detected NEA. A third observation from a telescope at a different geographical location will provide an effective parallax, allowing the distance to the asteroid to be determined. Spectroscopy, light curve and rotation periods will be determined using some of the remaining facilities in the GROWTH network.